Prior to starting, film the dumbbell to be used so the weight and plate size can be seen clearly. All video submissions should be uncut and unedited in order to accurately display the performance. A clock or timer, with the running workout time clearly visible, should be in the frame throughout the entire workout. Shoot the video from an angle so all exercises can be clearly seen meeting the movement standards. Videos shot with a fisheye lens or similar lens may be rejected due to the visual distortion these lenses cause. In the toes-to-bar, the athlete must go from a full hang to having the toes touch the pull-up bar. 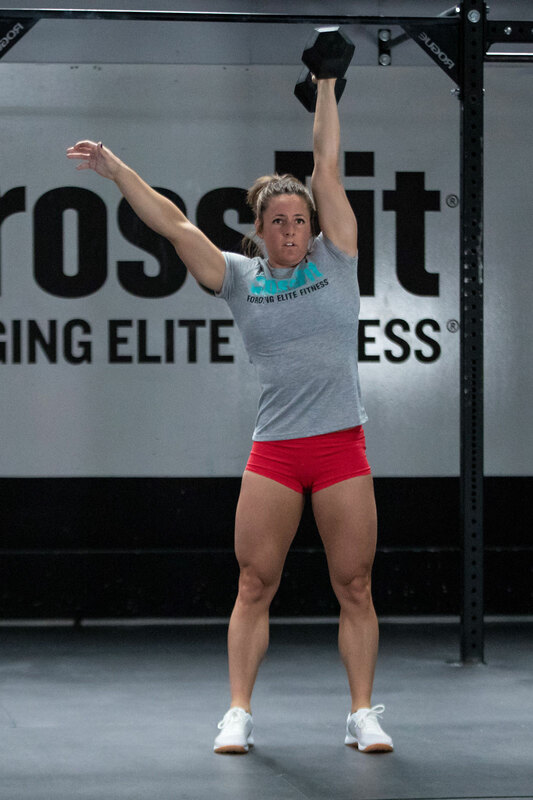 At the start of each rep, the arms must be fully extended with the feet off the ground, and the feet must be brought back behind the bar and the rest of the body. An overhand, underhand or split-grip are all permitted. After the dumbbell is lifted off the floor, the athlete must pause with the dumbbell at the hang position, either at his or her side or between the legs. From there, the athlete may perform a muscle clean, power clean, squat clean or split clean, so long as the dumbbell comes up and makes contact with the shoulder before being lifted overhead. Once at the shoulder, the athlete may get the dumbbell overhead any way he or she chooses. Shoulder press, push press, push jerk and split jerk are all permitted. The non-working hand may not come into contact with the body or the dumbbell while the dumbbell is being lifted. Athletes may use two hands while lowering the dumbbell between reps.
At the top, the arm, hips and knees must be fully locked out with the dumbbell clearly over the middle of the athlete's body when viewed from profile. Once the athlete has reached lockout, the repetition will count. If a split jerk is performed, both feet must return and be in line under the athlete's body while the dumbbell is locked out overhead. Each round, athletes must perform 5 repetitions on one arm, then switch and perform the next 5 with the other arm. The monitor on the rower must be set to zero at the beginning of each row. The athlete or the judge may reset the monitor. 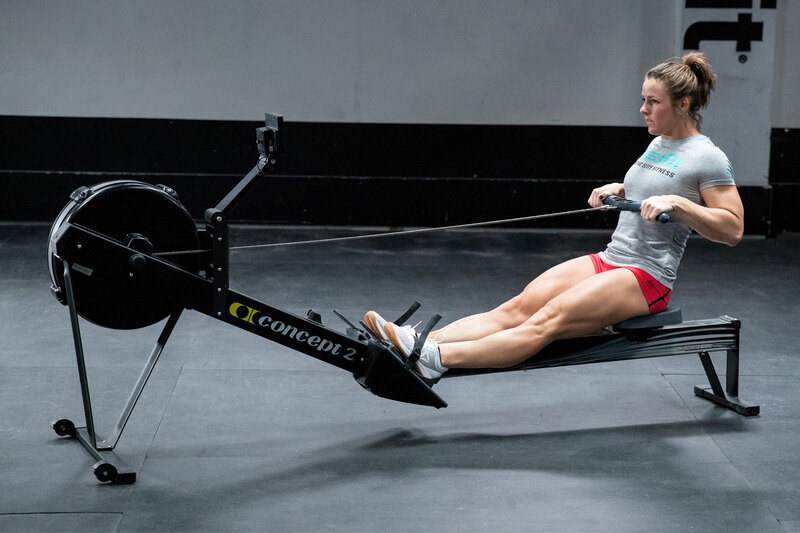 The athlete must stay seated on the rower until the monitor reads 14 / 12 calories. 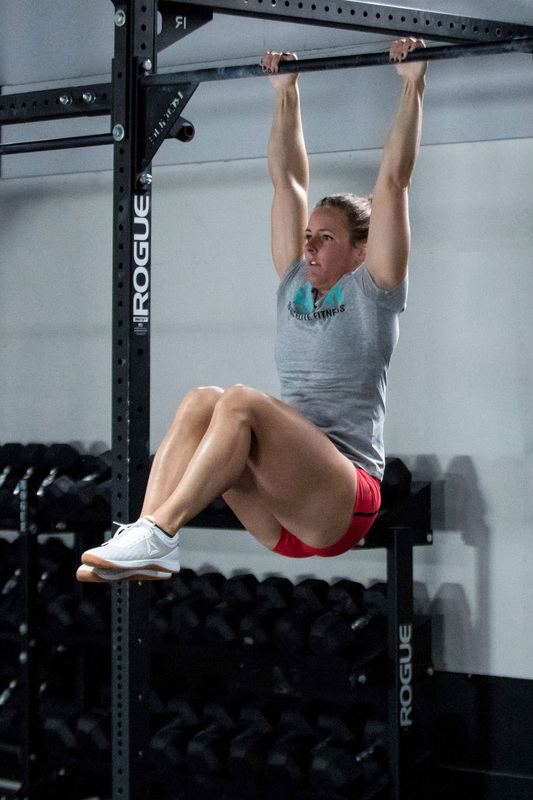 In the hanging knee-raise, the arms and hips must be fully extended at the bottom with the feet off the ground, and the feet must be brought back behind the bar and the rest of the body. An overhand, underhand or split-grip are all permitted. At the top of the repetition, the athlete must raise the knees above the height of the hips. Athletes may wrap tape around the pull-up bar OR wear hand protection (gymnastics-style grips, gloves, etc. ), but they may not tape the bar AND wear hand protection. Each rep of the sit-up begins with the athlete’s back in contact with the floor, the knees bent with the feet anchored, and the hands touching the floor above the athlete’s head. At the top, the athlete will raise his or her torso so the chest is upright and the hands touch the toes or the dumbbells. AbMats are permitted.